Acura wants its new RLX sedan to be a road going Nimitz-class aircraft carrier. The term “flagships” is often used to describe a company’s top model, but American Honda President Tatsuo Iwamura compared the RLX to the real thing. 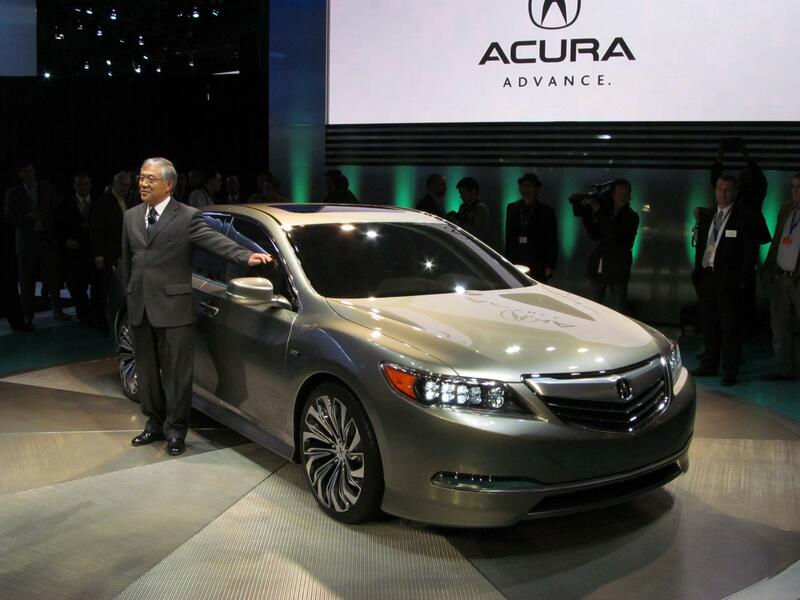 The biggest ship in Acura’s fleet was christened Wednesday at the New York Auto Show. Like a naval flagship, Iwamura said a flagship car should be the most powerful and advanced vehicle in a company’s lineup. Acura’s old flagship, the RL, got that title from its size, not from any class-leading technologies or impressive performance numbers. Iwamura wants the RLX to be a leader for the Acura brand, introducing new technologies that will trickle down to other models. It works for Mercedes (think S-Class), so it should work for Acura. The RLX’s biggest selling point is the all-wheel drive system it borrows from the NSX supercar. The second generation NSX was shown as a concept at the North American International Auto Show, featuring a hybrid powertrain with all-wheel drive. The NSX sat on the stage opposite the RLX, which is fitting because the sedan has the same setup. Acura calls the system Sport Hybrid Super Handling-All-Wheel Drive; it uses the hybrid drivetrain’s electric motors to shift power front-to-rear, or side-to-side, for better handling. The Sport Hybrid SH-AWD model will get most of its grunt from a 3.5-liter, direct-injected V6. Acura says the new engine will make over 370 horsepower, and get 30 mpg in all three EPA categories (city, highway, combined). A base model with front wheel drive will also be offered. The non-hybrid powertrain in that RLX will only have 310 hp, but it will come with Precision All Wheel Steer four wheel steering. In terms of styling, the RLX does what most big sedans do: look handsome and subtle. The crisper, more define lines are a huge improvement over the RL, but the new car does not set the world on fire. Iwamura joked that Jay Leno and Jerry Seinfeld will fighting over the RLX, just like in the NSX Super Bowl ad, but that probably won’t happen. Still, most luxury sedan buyers prefer a but of discretion, so the RLX might suit them perfectly. The RLX is officially a conceot car, which is another way of saying that Acura didn’t want to divulge specifics like price. If Acura wants to compete with established luxury brands like Mercedes and BMW, the RLX will have to take on their flagships: the S-Class and 7 Series. The old RL was not in the same league as those cars, so it will be interesting to see how Acura tries to place the RLX in the luxury segment. What car wouldn’t be better with this 1,000-horsepower Hellephant engine? The "Hellephant" is a 1,000-horsepower Hemi V8 "crate engine" that can be dropped into any pre-1976 car. It references one of the greatest muscle car engines in history, but incorporates modern tech from Dodge's Hellcat motor.